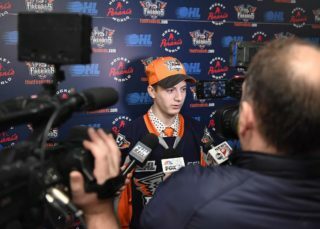 Flint, Mich. – The Flint Firebirds announced today that forward Kyle Harris, a seventh-round pick, 128th overall in the 2017 OHL Priority Selection, has committed to an Ontario Hockey League Standard Player Agreement and education package with the Firebirds. Harris, a native of East Aurora, NY, was heavily recruited with NCAA options before choosing to continue his hockey and academic development in Flint. The centerman played his AAA youth hockey with the Toronto Marlboros last season and recorded 26 points (10G, 16A) in 32 games. 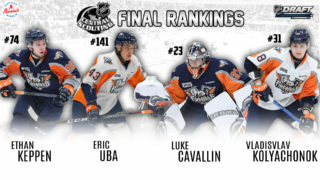 In his first pre-season game with Flint last Friday, Harris notched the third goal of the contest against the defending CHL Memorial Cup Champions, Windsor Spitfires. Harris will wear jersey number 19 with the Firebirds this season. 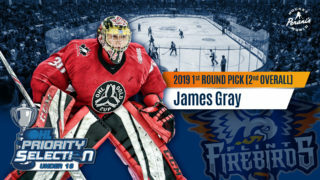 The Flint Firebirds will host in-state rival, the Saginaw Spirit in the Firebirds’ only home exhibition game of the 2017 Pre-Season on Saturday, September 16th. Game time is set for 7 p.m. at Flint Iceland Arenas on Elms Rd. in Clayton Township. Following the contest, there will be a postgame skate with the team event for all fans. Tickets are complimentary for Firebirds’ season ticket holders. General admission seating is $10 and can be purchased in advance at the Dort Federal Event Center Box Office, Iceland Arenas or online at ticketmaster.com here. Season ticket packages for the Flint Firebirds 2017-18 season are on sale now and can be purchased at the Dort Federal Event Center Box Office, Monday through Friday from 9 a.m. to 5 p.m. (ET). Season ticket holders receive FREE parking this season. For ticket information, contact Dominic Gutierrez at (810) 201-6904 or domg@flintfirebirds.com.